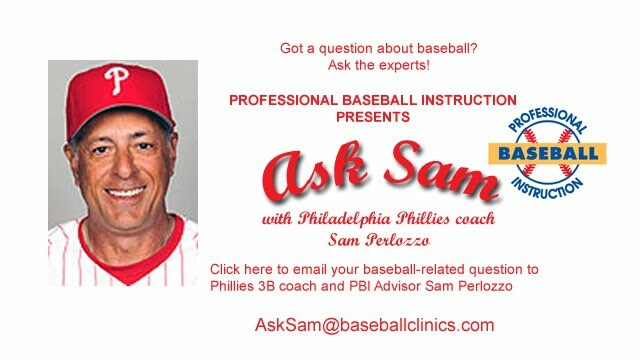 PBI Advisor Sam Perlozzo, first base coach for the National League Eastern Division Champion Philadelphia Phillies is regarded as one of the finest teaching coaches in professional baseball and now you can email Sam directly with questions you have about how to improve your game from one of the best in the business! We have some terrific questions from you this week to kick off this feature so let’s get started. A – Julio – That’s a great question and I wish I knew more about those things when I was younger. You do want your son to get stronger but not too bulky. He needs to stay flexible with his strength. Nothing beats throwing, and throwing long to keep the muscles stretched. The most common injury you hear these days are rotator cuff related. Any set of light dumbells can work on cuff strength. Also, I would recommend hand, wrist, and forearm strength. The dumbells will also take care of that. It is hard for me to actually put in print the precise excerise, but I am sure if you go online for roator cuff excercises etc. you will be able to find some good info. I would always find a way to throw alot first and foremost. Possibly rig up a net in the garage or basement where you can throw balls into and have a sensible routine of throwing, whether it is everyday, to every other day, or even two days on and one day off. Just use common sense on how his arm feels. Leg strength is also important in throwing! Quad lifts, hamstring lifts, and squats are all good. Try holding a dumbell in one hand and bending down to touch the dumbell to the floor while holding the opposite leg off the ground. That’s a good one! Also get a medicine ball,(any larger ball,basketball even) and put it against the wall behind your back, and do squats with the ball rolling against the wall. Killer for your thighs!! You can be creative with limited equipment. Find some surgical tubing and make it so that both feet fit inside a circle and gives resistance to your legs as you try to walk. All these are good. And remember with both arms and legs…..STRETCH….No pulled muscles!! A – Doc, first of all, hitting a baseball is probably the single hardest thing to do in all of sports. Think of how close you are to the pitcher, how little time you get to decide if it is a strike or a ball, if it’s a fastball or offspeed pitch, and then to hit it where no one will catch it…….and then fail 7 out of 10 times and hit .300 !!! That being said, most instructors are teaching to hit down and thru the ball. The reverse spin by hitting the middle to bottom part of the ball gives it a trajectory of backward spin and more carry. Think of what I said about how hard it is to hit, then you’ll realize how much harder we make it by swinging up and having to connect at the very precise moment to hit the ball, as opposed to a more downward to level swing which helps to keep the bat in the zone of the ball longer therefore making for more consistent contact for the hitter. It also helps to keep our head and eyes from any excessive movement. Hitting is basically timing. Getting the barrel of the bat into the hitting zone when the ball gets there. Any sort of dipping of the shoulders or head can make the bat take a longer arc to get to the ball. And as hitters advance in talent and leagues, it becomes more and more important to be able to get the bat in the zone as short and quick as possible. A – Tom, there are many keys to watch for and they are different for each individual. I can give you a few things to look for and then I will give you what I think is most common and the one I used more than any. * If you watch the pitcher’s right heel (foot), he has to lift that foot to throw to first. If it stays on the ground, he is going home. * Watch the pitcher’s left elbow….if it comes back at you, he is throwing to first and if it goes forward (inward), he is going home. * Sometimes a pitcher will try to look at the runner with his left shoulder slightly open(toward the runner); when he closes his shoulder, he goes home. * Now my favorite….anyone who throws a ball,(INF, OF, P)….usually has to move his shoulders back to get some power behind the throw. I call that a lean back. That is usually the most common tip for the runner because that is usually the very first movement a pitcher makes. Therefore, that would be the quickest attempt for the runner to steal a base. If you use slow motion it is easy to see and the runner just has to concentrate on the pitcher’s upper torso.